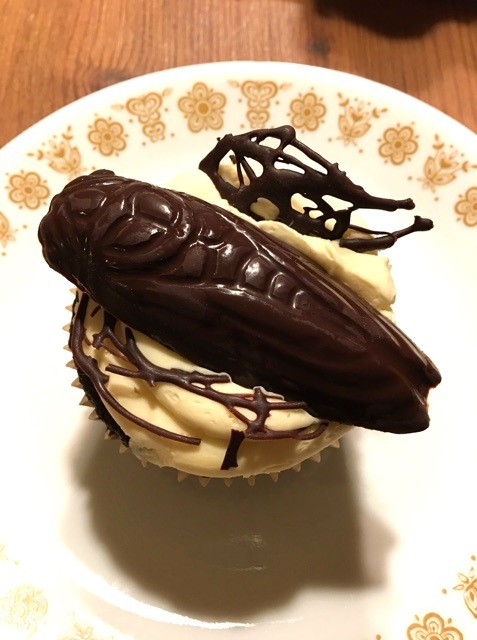 March 10th is my birthday and for my birthday my friend Lisa baked me cicada cupcakes with chocolate cicadas (made with cicada-shaped molds, not actual cicadas dipped in chocolate). 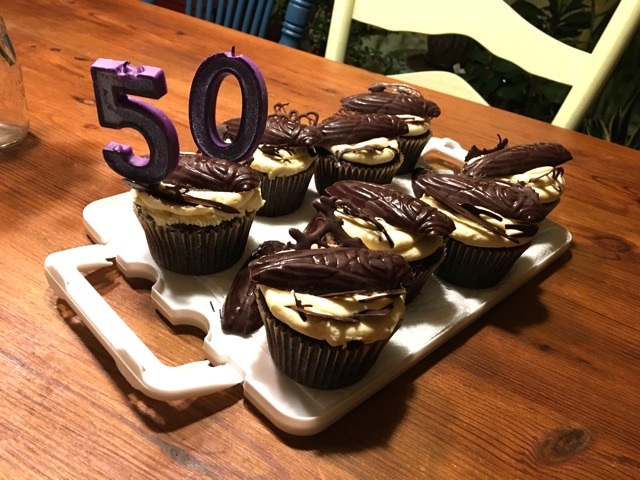 Yes, as of 2019, I am 50 which is 1 year short of 3 17-year Magicicada cycles. Cicada Mania has been around since 1996. It’s lived on at least five different domains (cicadamania.com is the current domain). Lots of history. Yesterday I was looking at old versions of the site on archive.org’s Wayback machine, which created archives of websites. I came across this post from 2001 and thought “these photos are not on the current site, let me upload them. So here’s a copy of the original post, approximately 18 years later. BTW, the cicada is Lyristes/Tibicen plebejus. Cicada Experts, try to ID this French cicada! Hello, In the south of France last week I saw a big insect. From the moment it climbed up a flower (picture 1) till the moment it became the one of picture 2 (10 hours later) I made 300 pictures with my Sony Mavica. Some questions; a) is this a cicada b) if so, whats the name c) do you know a site where I can find the sound of this species d) who could be interested in my pictures of the complete metamorphosis Greetings, H. Bakkenes Holland. In case you want cicada images and video to share, we’ve uploaded images to social media sites to make it easy to share the images. These images are often in the Creative Commons, or otherwise owned by Dan, and Dan doesn’t care if you share them. Other images, video, and audio on the site are copyrighted by the people who created that media, and I can’t grant use their work. And like everyone else, we upload content to Facebook, Twitter, and Instagram. Feel free to share that stuff as well. Knock your socks off. This website likely has grammar and factual errors. If you find one, feel free to send me an email: cicadamania@gmail.com. 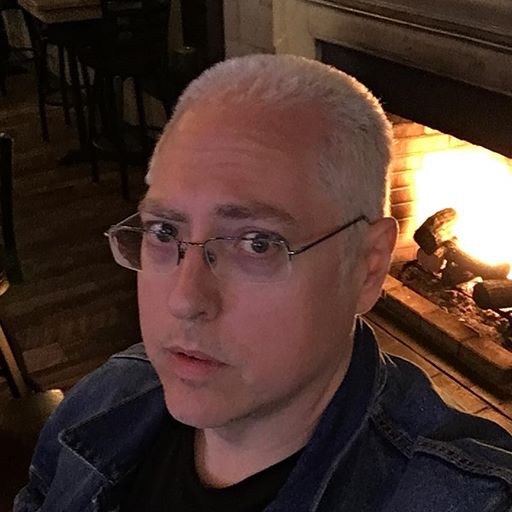 My name is Dan Mozgai, and Cicada Mania is my website. Use this email address to contact me: cicadamania@gmail.com. I usually have time to answer questions via email, Twitter, Facebook, and phone calls. If I don’t know the answer, I’ll refer you to an expert who does. Some other places to find me: iNaturalist and BugGuide. 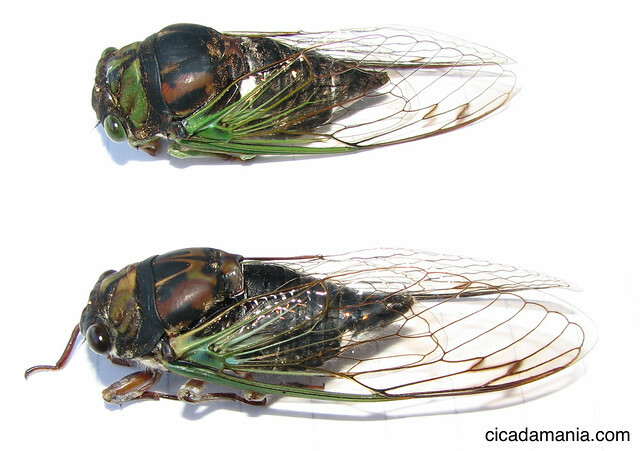 Here are some cicada images you are welcome to share. 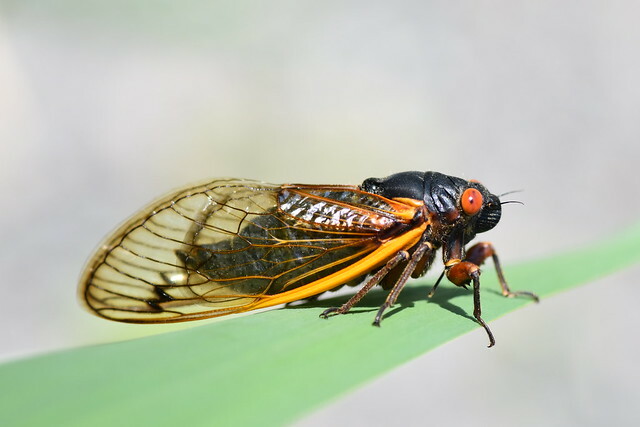 Here are some tips for the press planning to report on Magicicada periodical cicada emergence — mostly to steer you away from using photos of the wrong species. Cicada Mania started as an online photo album meant to share photos from the 1996 emergence of Brood II, particularly photos from a friend’s outdoor wedding, where the cicadas were an “uninvited guest”. The 2004 Brood X emergence was a fantastic time for Cicada Mania: highlights included me appearing on CNN, NPR, and WABC radio, and seeing 50,000 site visitors in one day. Here is a transcript of my CNN appearance. The 2007 Brood XIII emergence was fantastic as well. I finally got to meet fellow cicada enthusiasts and researchers Roy Troutman, Jerry Bunker, Gene Kritsky and Joe Green. I was also interviewed for Fuji TV. Cicada Mania currently contains over 1500 photos of cicadas (many high-res), videos, sound clips, a blog, plenty of FAQs and articles, of course, t-shirts and mugs, which are my attempt at funding the site. Discovery of psychoactive plant & mushroom alkaloids in ancient fungal cicada pathogens. Greg Boyce, Emile Gluck-Thaler, Jason C. Slot, Jason E. Stajich, William J. Davis, Tim Y. James, John R. Cooley, Daniel G. Panaccione, Jorgen Eilenberg, Henrik H. De Fine Licht, Angie M. Macias, Matthew C. Berger, Kristen L. Wickert, Cameron M. Stauder, Ellie J. Spahr, Matthew D. Maust, Amy M. Metheny, Chris Simon, Gene Kritsky, Kathie T. Hodge, Richard A. Humber, Terry Gullion, Dylan P. G. Short, Teiya Kijimoto, Dan Mozgai, Nidia Arguedas, Matthew T. Kasson. doi: https://doi.org/10.1101/375105. 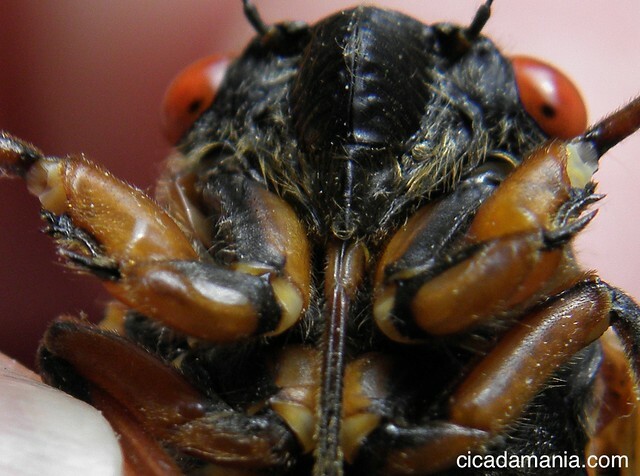 Many of the cicada photos and videos on the site come from Roy Troutman. Visit the Roy Troutman page for links to his images and his contact information. Elizabeth McGrath: U.S.A. based artist. Death Cab for Cutie: U.S. rock band. This page collects most of the fun stuff on the site. Everything on the site is fun, but these are fun on purpose. 2) Another PDF of cicada images to color, cut out or otherwise repurpose for fun and enjoyment. (PDF file 3.3MB). 3) Cicada Cursors if you like to customize your PC (Windows). Unfortunately, it’s one of those things that only works on Windows. Technically you can use CSS to make them appear on desktop web pages as well. 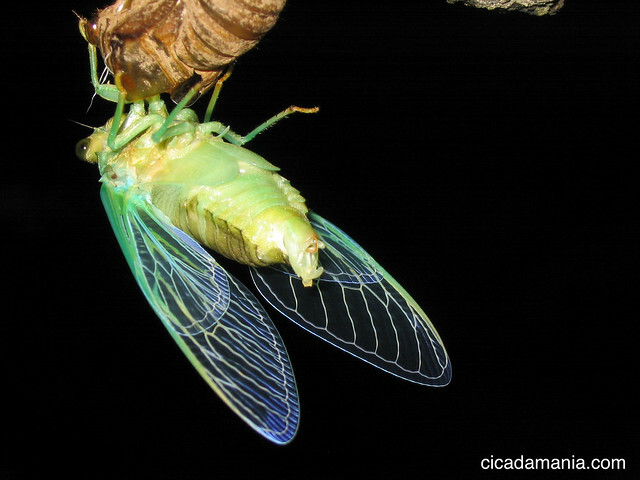 6) Six Cicada Experiments you can perform. 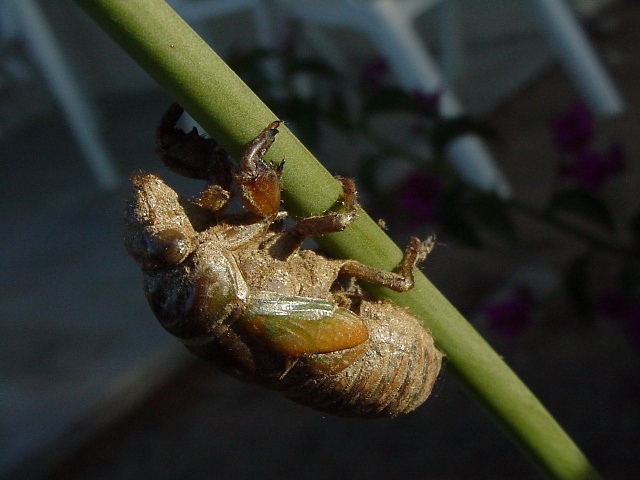 7) Use the Periodical Cicada Emergence Checklist to track your enjoyment of a periodical cicada emergence. People worry if cicadas are safe to eat, especially for pets. Do you have a cicada sipping on the root of your Xmas tree? 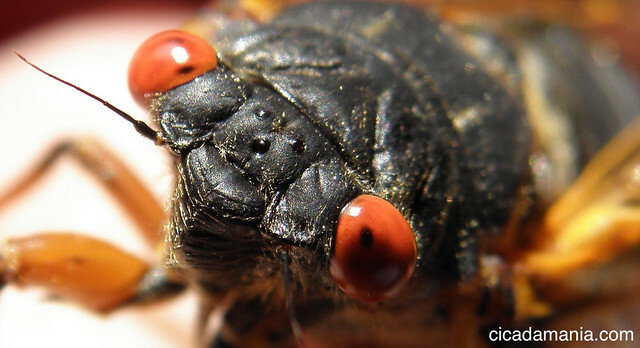 People worry if cicadas will spoil their weddings. 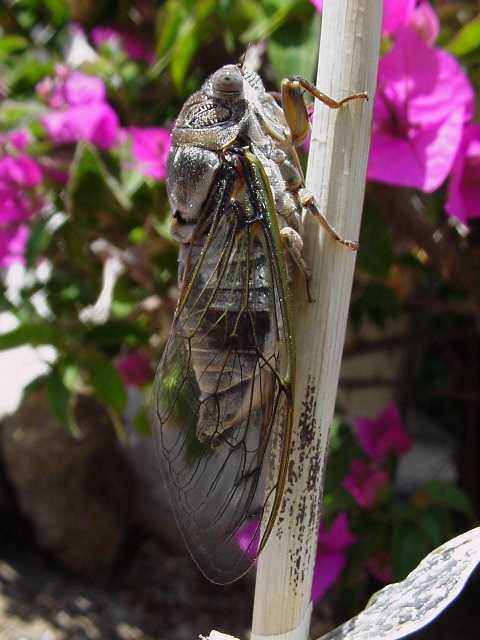 This is an image of a cicada bride. 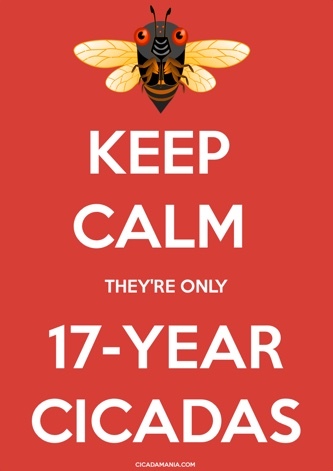 Keep Calm – They’re Only 17-Year Cicadas Meme. Get the t-shirt and support this website. for Men or Women. If you want to support Cicada Mania, the best way is to share the site with friends and family… but you can also buy some Cicada Merchandise. At the start of 2018 Australia has been having an awesome cicada season, which should continue through to March, depending on the species and part of the country. The best months of the cicada season in New Zealand are December – April. Throughout the world, annual cicada emergences will follow their usual cycles. The World Cup Cicada, Chremistica ribhoi, will return after 4 years in Meghalaya, India. Magicicada cicadas will return in 2018 in New York State after 17 years. Brood VII aka the Onondaga Brood can be found in the Finger Lakes area of New York. Magicicada stragglers should also make an appearance in limited numbers. Brood XXII stragglers, emerging 4 years late, in mid-east Louisiana, south-west Mississippi, south-west Ohio and north-central Kentucky. Brood VIII stragglers, emerging 1 year early, in western Pennsylvania, eastern Ohio, and the West Virginia pan handle. 20,000 or so years ago the earth was a colder place. Glaciers covered much of North America, including many states that currently are home to Magicicada, and other species of cicadas. There were glaciers in Wisconsin as recently as 9,500 years ago. The area below the glaciers were dominated by taiga, a landscape dominated by sappy evergreens and grasses (mastodon food). Florida was three times the size it was today. Where were the Magicicada 20-10 thousand years ago? Did they exist in a primordial form some place in the primordial woodlands of mega-Florida? How did deciduous trees (oak, maple, ask, etc) spread northward, and how did the Magicicada spread with them? Did the spread of deciduous trees northward into America play a part in the unusual life cycle of Magicicada, including the long lifecycle and 4 year accelerations? Were the Neotibicen and Neocicada also living in mega-Florida or perhaps Mexico, and then spread northward as temperatures rose? Were Okanagana able to exist in the colder, evergreen-dominated taiga of the time of the last glaciers? For some reason this stuff intrigues me. Thank goodness my local library has a Jstor account. I felt bad about always using an illustration of North American cicadas, so I made a Green Grocer cicada for Australian fans. Get this image on a shirt, mug or even a pillow case via CafePress (the mugs are the most affordable). The Cicada Cursor is back! Here’s something for Windows users: cicada cursors. If you like to customize your PC, you can swap out your cursor with a cursor shaped like a cicada. Download the cicada cursor it today (download and unzip). Here’s a tutorial for changing your cursor. I have no idea if you can change the cursor on a Mac or mobile device. Update! Try the new Magicicada cursor (.cur file in .zip file)! Comments Off on The Cicada Cursor is back!